Join us for four incredible and intimate days on the World Famous Rubicon Trail. Limited to just 20 Jeeps, this trip will take have you meet the team on Sunday, August 18, 2019 at Prairie City SVRA where we will do a "mini Skillz Day" to ensure everyone has the skillz needed to enjoy the Rubicon Trail. Then we will head up the hill and camp near the entrance to the famous Rubicon Trail. The next morning, Monday, August 19, we will head in guided by the experienced team of Rubicon Veterans and support staff from Metalcloak, our corporate sponsor. 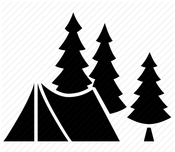 Each night we will camp in a different location including one exclusive location that is not open to the public. Breakfast, Lunch and Dinner will be provided each day including a final, wrap up banquet on Wednesday, August 21. Be prepared for an epic few days on the World Famous Rubicon Trail. This is fast becoming ModernJeeper Adventures signature event. Take your Jeep Wrangler in on The Famous Rubicon Trail where you will tackle obstacles with the help of our veteran guides. Camp for two nights at the Historic Rubicon Springs, right along the beautiful waterway, with all food and amenities provided. Take a dip in the Rubicon Lake and try your hand at the Rope Swing, or take shower directly under the invigorating waterfalls. 2. All participants shall be 12 years or older. 3. All vehicles shall be equipped with seatbelts, roll bar(s), skid plates and tow hooks - stock Jeep components are fine. 4. All jeeps shall have 35" tires or greater. 5. All Jeeps shall have at least one "Locker"
6. All vehicle occupants shall be registered participants in the ModernJeeper Adventure. 7. There shall be no illegal drugs, firearms, fireworks, sirens or pets. Possession of any of the foregoing may result in expulsion of any participant from the event. 8. There shall be at least one person in every vehicle 18 years of age or older who will be responsible for the occupants of the vehicle. 9. All participants shall abide by the rules of the event. 10. No vehicles will be washed in or near lakes, rivers, streams, or ponds out of respect for the environment. 11. All vehicles shall be properly insured for liability and medical coverage. ​12. DUIs, open containers, and other infractions will be cited.